No wonder the dinners held by king Stanislaus August Poniatowski every Thursday were called “wisdom dinners”. During those four-hour long feasts, guests discussed matters relating to arts, literature and science. Consequently, the Thursday dinners significantly influenced the 18th century art. Little has changed since the first dinner held in the Blue Palace in 1770. Nowadays, a dinner is still the main meal for many of us, during which we can gather in a group of family or friends and discuss important matters while savouring the food. At DekorBuy, we offer you beautiful hand-painted pottery products, whose fineness has been renowned and admired for years. As the manufacturing method has not changed for centuries, we can guarantee that our products offer the highest possible quality. Plates, bowls or soup tureens painted and stamped by hand will make your table fit for a king. 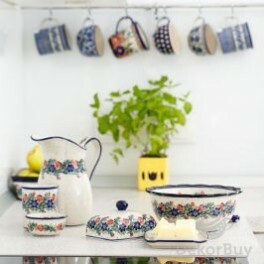 DekorBuy pottery will make you feel like royalty!